Catherine (Fuch) Sanders was my g-g-g grandmother. She was born in Hesse-Darmstadt, Germany in Feb 1823 and immigrated to the United States about 1846. She married A.F.E. Sanders, who died in 1891. Interment was made in Greenwood Cemetery, but I do not know the location of her grave. The 1900 U.S. Federal Census lists her as having 11 children. I can positively identify six children: John Henry Sanders, Ernest Vincent Sanders, Catherine Sanders, Edward Sanders and Sarah (Sanders) Hansing, and Margaret (Sanders) Fairweather. * This date is outside the index, so I’ve wondered if it was transcribed to the web properly. 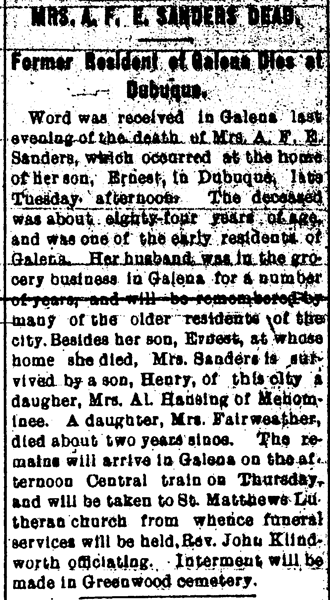 Catherine’s obituary was published in the Galena Daily Gazette on August 21, 1907. Word was received in Galena last evening of the death of Mrs. A.F.E. Sanders, which occurred at the home of her son, Ernest, in Dubuque, late Tuesday afternoon. The deceased was about eighty-four years of age, and was one of the early residents of Galena. Her husband was in the grocery business in Galena for a number of years, and will be remembered by many of the older residents of the city. Besides her son Ernest, at whose home she died, Mrs. Sanders is survived by a son, Henry, of this city, a daughter, Mrs. Al. Hansing of Menominee. A daughter, Mrs. Fairweather, died about two years since. The remains will arrive in Galena on the afternoon Central train on Thursday and will be taken to St. Matthews Lutheran church from whence funeral services will be held. Rev. John Klindworth officiating. Interment will be made in Greenwood cemetery. You have a date typo under Catherine Sanders. Loved the Christian Smith article. Great catch! I corrected the error.